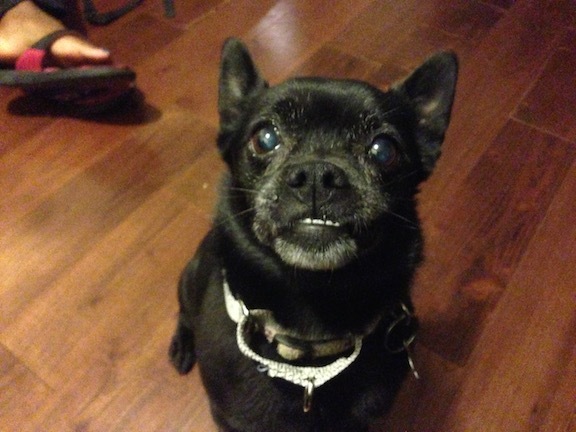 Ruby is a seven-year-old Schipperke Pug Mix who lives in Inglewood, California. Her owner contacted me for help with her dog aggression when out for walks. Barking, lunging and rushing towards any dog she see’s when out for a walk. When I arrived for the session, Ruby was excited and curious to meet me so I ignored her. After saying hello to her owner, Ruby started to sniff the air picking up my scent, Because she was using her nose, I let her invade my personal space a little farther than I normally would for a first greeting. Ruby’s owner invited me into her home and directed me to the living room saying “You can sit on Luna’s couch.” That was my first tip that this dog may not be getting the proper rules and structure it needs from its owner. When I pointed this out to Ruby’s owner she laughed as clearly that was not a conscious decision she had made. Its just how she gradually became to think about the situation. But in order to stop Ruby’s reactiveness to other dogs, her owner needs to assume to the leadership position in their relationship. A great way to redefine the leader follower dynamic is by adding rules, boundaries and limits to the dog’s routine. This gives the owner practice leading and correcting their dog. The more this happens, the less the dog see’s and identify’s with it being the enforcer of security, i.e., “we don’t need you to deal with dogs we meet, i have the situation under control. After showing Ruby’s owner how to claim the couch I turned my attention to the dog’s flagrant disregard for her owner’s personal space. I had noticed that the dog was consistently leaning on or against her owner’s legs or between them as I spoke with her owner. While its great to have contact with your dog, I wanted Ruby to stop thinking that she had that level of access to her owner’s personal space. I showed her owner how to disagree with her before she came too close or leaned against her. It only took a few corrections before Ruby calmly sat at a respectful distance in front of her owner while calmly looking at her with a new sense of respect. One of Ruby’s owner’s frustrations with the was that Ruby did not always obey her when she was corrected. To help with this issue, I went through a few leadership exercises with her owner. Practicing them while inside of their apartment is the important first step to reconditioning the dog to be less reactive. When you’re dealing with behavior modification it’s very important to start slowly , go in steps and practice in a controlled environment. When it comes to your dog, there is no better controlled environment than the inside of your home. I suggested that Ruby’s owner practice these leadership exercises multiple times a day for the next 10 days to two weeks. Only after Ruby has mastered these exercises inside, will her owner be in a position to lead and correct her when she engages in the unwanted behaviors outside of their home. While Ruby is not in overexcited dog, there were a few activities that clearly got her blood going. I witnessed one of these when her owner picked up the leash when I became time to take the dog for a walk. As soon as her owner walked over to where the leash was, Ruby started to show signs of excitement. Her breathing sped up, she started darting around the room running in circles and jumping up. As soon as the dog started to engage in this unwanted behavior, I had her owner put the leash back then walk to the couch. It’s important to stop or pause whenever a dog starts getting too excited, especially if it happens in conjunction with an activity that leads to the dog getting out of control. After sitting back down on the couch. we waited about 60 seconds. That’s all the time it took for Ruby to call myself down. What her owner stood up and grab the leash, Ruby remained in a sitting position looking at her calmly. Whenever you take your dog to engage in any activity, the energy that it has before the activity starts is generally the energy that the dog is going to maintain throughout the activity. By pausing and waiting for the dog to settle down before moving forward during these activities, we can help the dog learned that the only way it gets to engage in the activities they love so much is by remaining completely calm. Because Ruby pulled on the leash, I fitted her up with a Martingale collar and added the special twist to the leash. Ruby’s owner had never seen a leash applied this way before but was impressed with how much control it gave her over the dog. During our walk around the block we encountered a number of neighborhood dogs; some behind fences, some on a leash, some running free. Each time that we encountered one of these dogs, I showed Luna’s owner how to take control of the situation. We went over a number of different techniques and the dog responded fairly well to most of them. We were even able to get her to walk near barking dogs without barking or reacting at all. All while Ruby’s owner was guiding her. By the end of the session, Ruby was completely calm. She had stopped trying to get on the couch after only three corrections, was showing a nice respectful 2-3 feet of space for her owner and was responding immediately to each command and correction. Ruby’s transformation is not going to happen overnight. Once her owner has instilled the proper foundation or leadership and conditioned Ruby to stay calm, she will be able to start gradually exposing Ruby to new dogs in controlled situations. By using positive reinforcement, a structured exposure plan and sticking with it, her owner will be able to teach Ruby to not only get along with other dogs, but to learn to actually like them.